Aloe is a large genus of plants with rosettes of succulent leaves and spikes of tubular or bell-shaped cream, yellow, orange or red flowers. They are native to Africa and the Middle East and can be used as easy-care landscape plants in USDA plant hardiness zones ranging from 8 to 12 or as houseplants elsewhere. Depending on the species, these succulent perennials range in size from 2 inches (5 cm) to 70 feet (21 m) tall. These drought-tolerant plants prefer well-drained soil and full sun or partial shade and spread by offsets that grow from the base of the plant. Although most problems associated with Aloes grown as houseplants are bacterial or fungal diseases caused by overwatering, they do get the occasional insect pest. 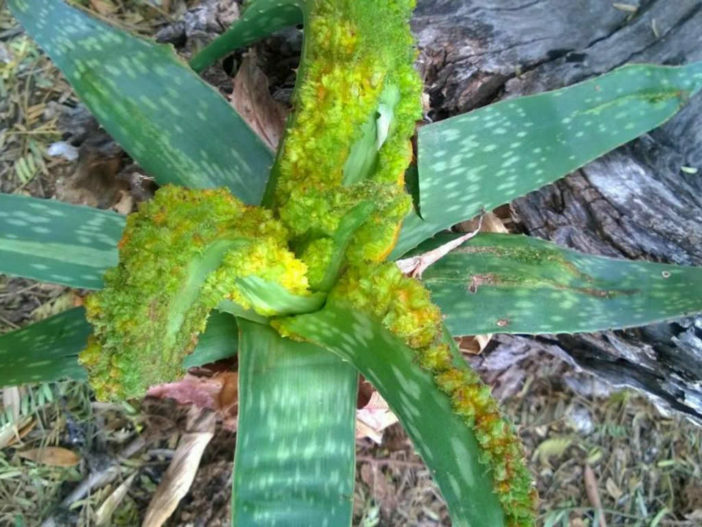 Severe damage to some Aloes is caused by Aloe Mite, also known as Aloe Wart Mite or Aloe Gall Mite. It is a eriophyid mite known as Aceria aloinis. Eriophyid mites are very small and are only visible using a microscope. They are worm like with only 2 pairs of legs and are poor crawlers with their primary method of population spread being by wind. You will never see an Aloe Mite crawling around on your Aloes, but you can definitely see the damage that it leaves behind. While feeding on plant tissues, this microscopic relative of the spider injects a chemical into the plant that causes masses of warty, tumorous-looking growths on leaves, stems, and flowering stalks. This mass, called Aloe Cancer, Aloe Wart, or Aloe Gall, will often grow around the tiny insects, protecting them from the outside world while they feed on the rapidly-growing tissues and lay eggs. Until these strange growths show up on your Aloe, it is impossible to know that the mites are present. It is possible to save an irreplaceable Aloe with early detection, removal of galls and treatment with pesticides, but keeping this plant in your collection runs the risk of spreading the tiny insects to other Aloes. Aloe Mites are small enough to travel to new plants on a gust of wind and treatment of an infestation can be a lengthy, tedious and expensive endeavor. The best way to protect the rest of your Aloes from becoming infested is to remove any affected plants from your collection as soon as you see warts or galls forming. Put the plants in garbage bags and throw them away rather than composting them. Once the problematic plants have been removed, consider replacing them with a species of Aloe (Aloe ‘Blue Elf’) that is resistant to these pests.